This past month The Burghers of Calais have been kept under wraps. No, they haven’t been shrouded in secrecy, they’ve been swaddled in blankets. 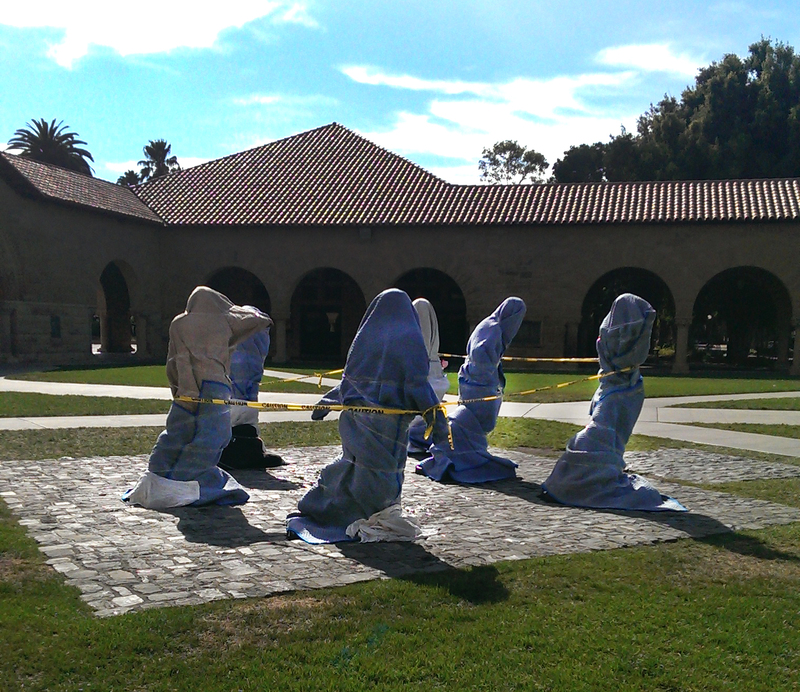 The Burghers of Calais, one of Auguste Rodin’s most famous collection of statues and among the premier pieces in the Stanford collection, have been in preventative protection during a nearby drainage-modification project (the old system was causing pooling). The Outdoor Sculpture Conservation Crew first washed the statues using a mild detergent called Orvus, then rinsed and dried the bronzes with lint-free rags. The state of the protective wax coating was assessed, and the six bronze men were wrapped in heavy duty blankets (more about this process here…). Once the construction was complete, the statues were unwrapped, safe, sound, and ready to pose with their many visitors.